The 4th row: Presidential Palace. Vilnius is the capital city of Lithuania. It is also the largest city in that country. Vilnius is the largest city and the capital of Lithuania, with a population of 553,904 (850,700 together with Vilnius County) as of December 2005. It is the seat of the Vilnius city municipality and of the Vilnius district municipality. It is also the capital of Vilnius County. Vilnius lies 312 kilometres (194 mi) from the Baltic Sea and Klaipėda, the chief Lithuanian seaport. Vilnius is connected by highways to other major Lithuanian cities, such as Kaunas (102 km/63 mi away), Šiauliai (214 km/133 mi away) and Panevėžys (135 km/84 mi away). According to the 2001 census by the Vilnius Regional Statistical Office, there were 542,287 inhabitants in the Vilnius city municipality, of which 57.8% were Lithuanians, 18.7% Poles, 14% Russians, 4.0% Belarusians, 1.3% Ukrainians and 0.5% Jews. Vilnius is a cosmopolitan city with diverse architecture. There are more than 40 churches in Vilnius. Restaurants, hotels and museums have sprouted since Lithuania declared independence. Aušros Vartai Street. The icon of The Virgin Mary, Mother of Mercy is venerated in a chapel at the medieval gate at the top of this street. Like most medieval towns, Vilnius was developed around its Town Hall. The Old Town, the historical centre of Vilnius, is one of the largest in Europe (3.6 km²). The most valuable historic and cultural sites are concentrated here. The main sights of the city are Gediminas Castle and Cathedral Square, symbols of the capital. The Old Town of Vilnius was inscribed on the UNESCO World Heritage List in 1994. In 1995, the first bronzecast of Frank Zappa in the world was installed near the center of Vilnius with the permission of the government. Vilnius is the major economic centre of Lithuania and one of the largest financial centres of the Baltic states. Vilnius is the Roman Catholic center of the country, with the main church institutions and Archdiocesan Cathedral located here. There are many churches in the city as there are many monasteries and religion schools. The Church architecture in the city includes Gothic, Renaissance, Baroque and Neoclassical styles, these styles can be foundin the Old Town. Vilnius is considered one of the main centers of the Polish Baroque movement in architecture of churches. Vilnius has been home to an Eastern Orthodox Christian presence since the thirteenth century. A famous Russian Orthodox monastery, named for the Holy Spirit, is located near the Gate of Dawn. St. Paraskeva's Orthodox Church in the Old Town is the site of the baptism of Hannibal, the great-grandfather of Pushkin, by Tsar Peter the Great in 1705. A number of Protestant and other Christian groups are present in Vilnius, most notably the Lutheran Evangelicals and the Baptists. The Choral Synagogue of Vilnius, the only synagogue in the city to survive the Holocaust. 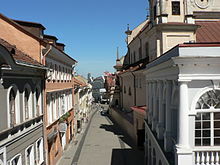 Once widely known as Yerushalayim De Lita (the "Jerusalem of Lithuania"), Vilnius once was comparable only to Jerusalem, Israel, as a world center for the study of the Torah, and for its large Jewish population. That is why one part of Vilnius was named Jeruzalė. At the end of the 19th century, the number of synagogues in Vilnius was more than hundred. Islam came to Lithuania in the 14th century from Crimea and Kazan, through the Tatars. Tatars in Lithuania have maintained their religious practices: currently, about 3,000 Tatar Muslims live in Lithuania. There are same few groups of pre-Christian pagan in the city. Vilnius is the starting point of the Vilnius-Kaunas-Klaipėda motorway that runs across Lithuania and connects the three major cities. The Vilnius-Panevėžys motorway is a branch of the Via-Baltica. Vilnius International Airport serves most Lithuanian international flights to many major European destinations. Vilnius has a public transportation system. There are over 60 bus and 19 trolleybus routes, the trolleybus network is one of the biggest in Europe. Over 250 buses and 260 trolleybuses transport about 500,000 people every day. In the end of year 2007 a new electronic monthly ticket system was introduced. Vilnius has 14 sister cities. ↑ "Total area and population by administrative territory, statistical indicator and year". Statistics Lithuania. 22 March 2013. Retrieved 15 February 2014. ↑ Number of population by county, city (town) and municipality |Statistics Lithuania © Department of Statistics to the Government of the Republic of Lithuania (Statistics Lithuania). Accessed May 2, 2006. ↑ Kottek, M., J. Grieser, C. Beck, B. Rudolf, and F. Rubel (2006). "World Map of the Köppen-Geiger climate classification updated". Meteorol. Z. 15: 259–263. doi:10.1127/0941-2948/2006/0130. This page was last changed on 15 March 2018, at 14:33.